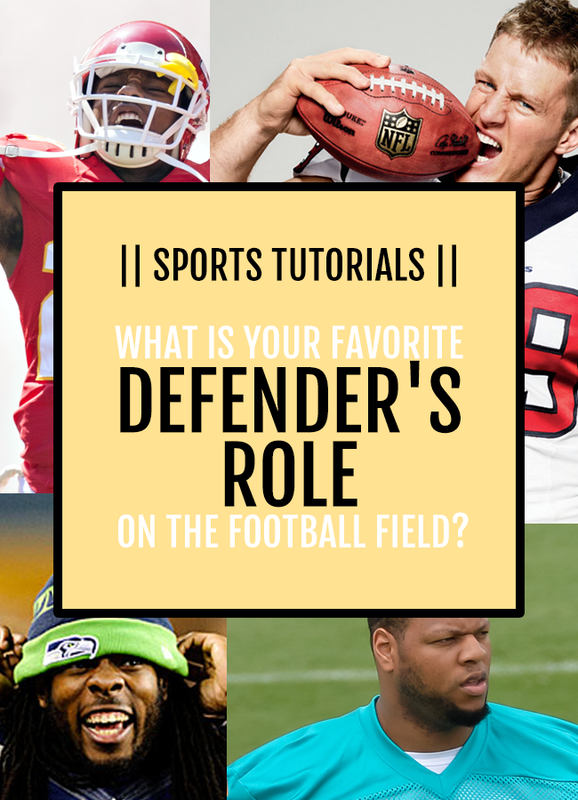 What Is Your Favorite Defender's Role on the Football Field? I was listening to my favorite morning program, Mike and Mike, earlier this week and they were faced with a trivia question to answer. Golic (one of the Mikes) made a guess, and Greeny (the other Mike) told him, "Incorrect. It's the guy who stands to his left." CB and I carpool together since my work is on the way to his, so I looked over to him and asked, "Would you really be able to name the guy to someone's left???" He of course looked at me like I had 12 heads and snorted, "Well, yeah. You can't?" Honestly, not really. Offensive players are one thing, but the other side of the ball leaves me a little hazy. I figured if I felt this way, I wasn't the only one. 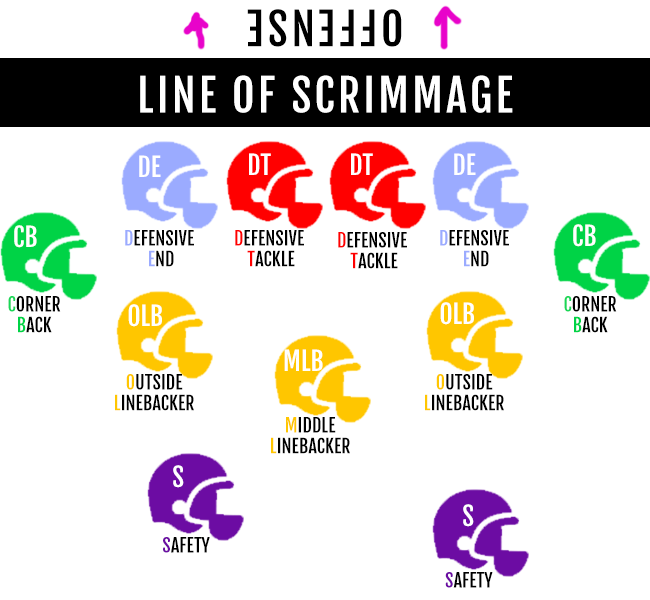 So today I thought I'd do a breakdown of some of our favorite defenders in the NFL, and where they line up on the field. This is as much for me as it is for anyone else! Now keep in mind, there are variations based on formation, but for today I'm going to keep it very basic with one single formation. || On a run play || Stop any run that the defensive ends let through. || On a pass play || Cover any passes thrown in his area of coverage. 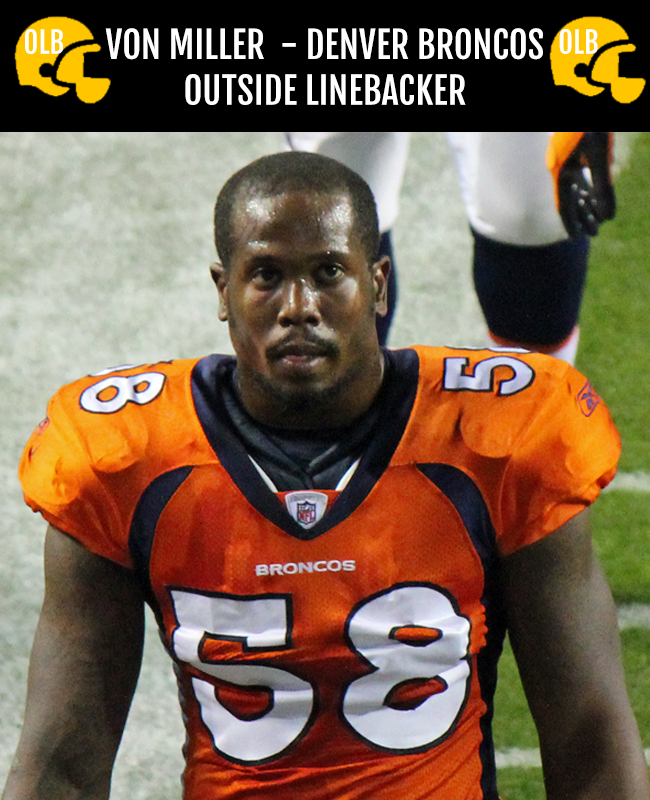 The outside linebacker, Von's position, is the most important position for the linebackers. He is stationed where the most receivers will be. If the offense has a wide receiver and a tight end on Von's side of the field, he has the responsibility of stopping both the run and covering the pass for anyone on his side. 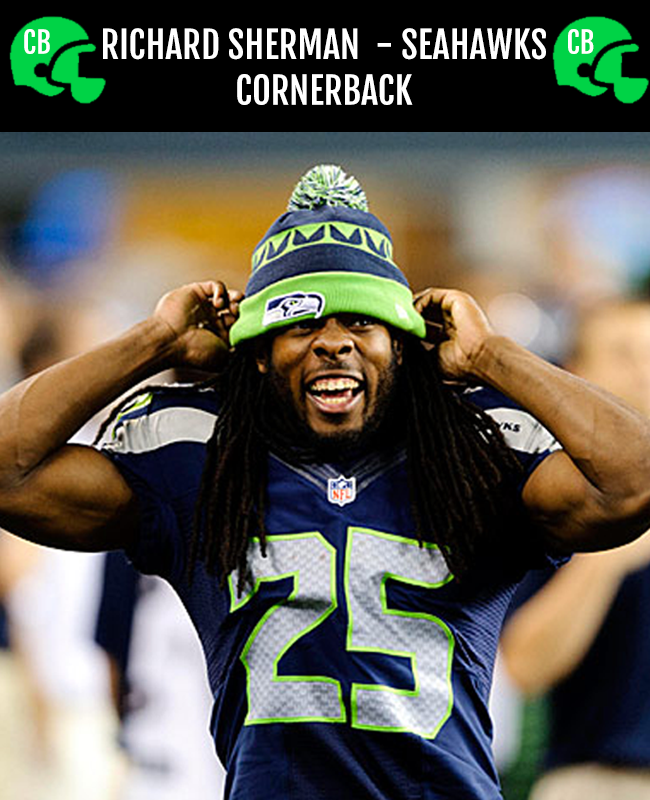 Sherman is expected to be one of the fastest players on the field, both mentally and physically. If the QB launches the ball into the air for a Wide Receiver, Sherman is expected to intercept the ball, or at the very least, break that pass up. || On a run play || Suh has to clog up the middle so the running back can't break straight up the field. || On a pass play || His job is to push the guys on offense (the center and the guards) backwards to give the Defensive Ends a clear line to the QB. :: For example :: If Suh and JJ Watt were on the same team, Suh would be clearing way for JJ to get to the QB. Make sense? There is a chance you haven't heard of Eric Berry, but you need to know who he is. 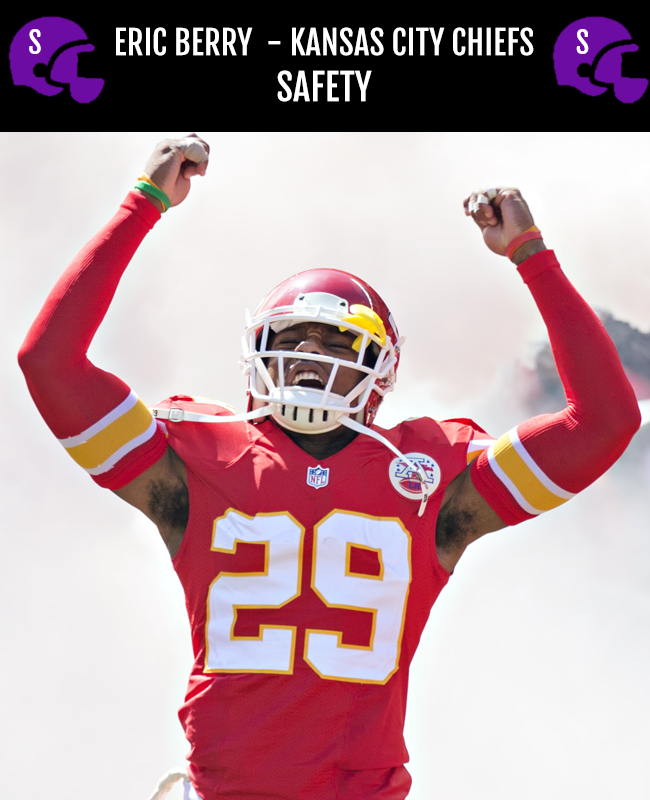 Eric Berry *ahem* a former Tennessee Volunteer, just beat cancer in about 7 months. He was diagnosed with cancer in December, and was cleared to return to play earlier this month. Like I said, you should know him. Eric's job is simple, but difficult He is the absolute last line of defense on the field. || On a run play || If the runner gets past everyone else, HE HAS TO TACKLE THE RUNNING BACK. If he doesn't, a touchdown will occur. || On a pass play || Any pass launched downfield that gets past the cornerback/linebacker, Eric is expected to cover. Also, if a wide receiver catches a pass over the cornerback, Eric is expected to tackle him before he can get into the end zone. His position is essentially damage control, making him very, very important. 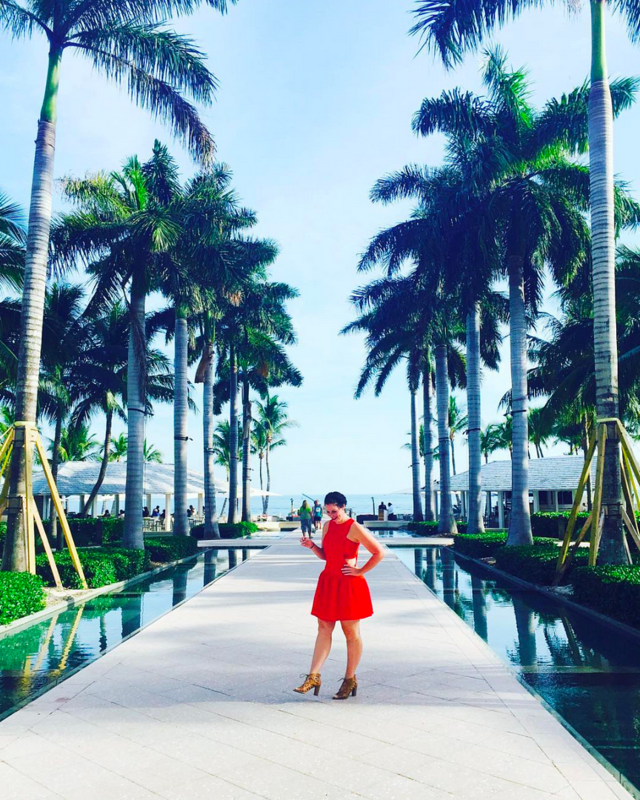 This post was as helpful for me to write as I hope it will be for you guys to read! Are there any players you love, but you're not sure what their role on the field is? Leave me a question and I'll do my best to get you an answer! P.S... Don't forget to use the hashtag #gamedayvibes to link up any and all sports related Instagrams!! hold on tho: y'all carpool to work?! that's so cute. I pretty much knew none of this, at all. i feel so educated!! Wow look at this post! Gotta give some love to my boy Troy Polamalu though-- easily one of the best safeties the NFL has ever seen (even though he's retired now). Great idea, Sarah! I still can't believe such left the lions. Love this! Getting so amped up for football season! Are you doing the bloggers fantasy league again this year?? I had such a blast with it last year! I seriously had no idea what all of the defensive players did, especially since I'm not in a league that drafts individual players. I feel like football players always get a reputation for being stupid, but they have to be pretty smart to be able to run all of the plays! This is great! I knew of all those positions but not exactly what they were responsible for. THANKS! 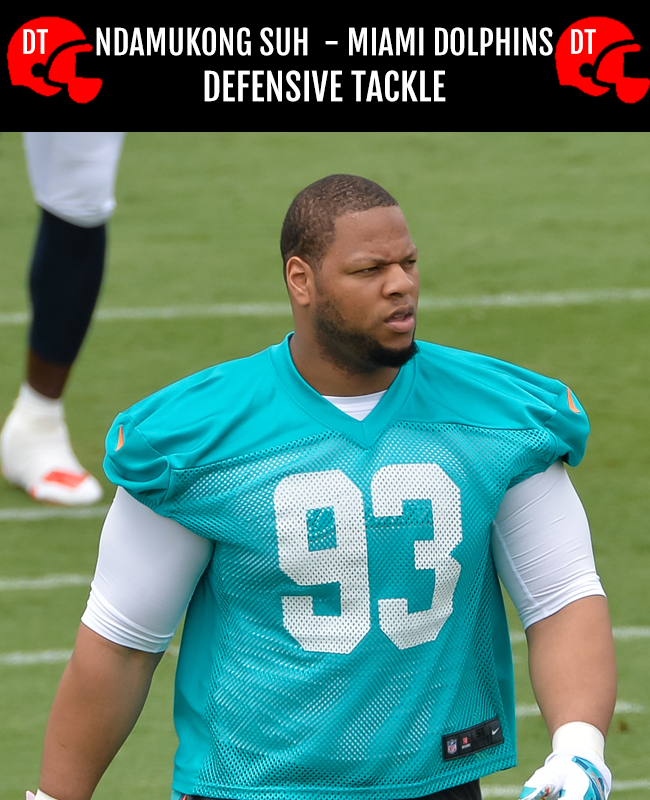 Also, bleh, does anyone love Suh? I don't think so. He's a jerk. HAHA! Oh, I'm sorry. 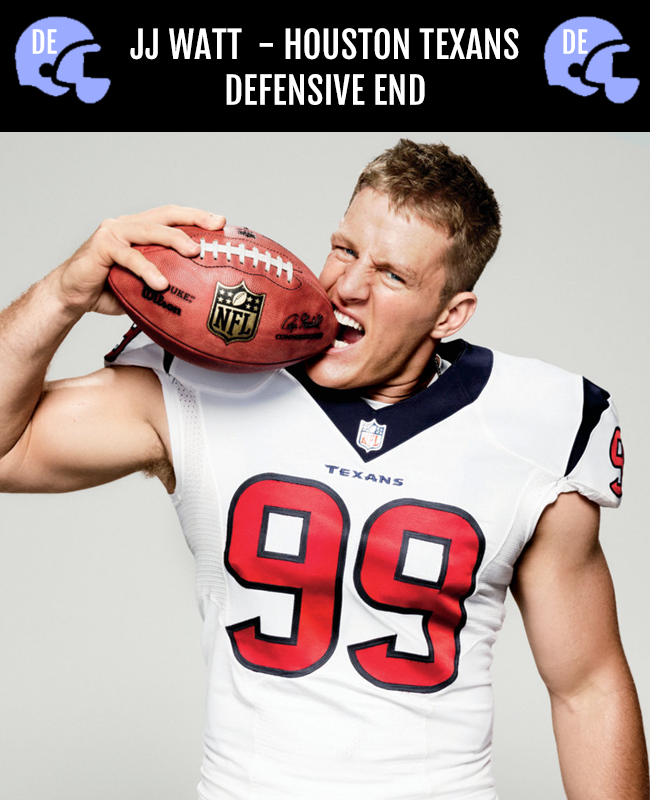 I didn't catch anything after that tremendous picture of JJ Watt. Kidding, but only kinda. Excellent guide! I'm not a fan of Suh, but man, oh man - Eric Berry is a BEAST.